In the 17th and 18th Century, St Lucia switched from French to English rule and back again some 14 times in 150 years. The reason? Its strategic location in the middle of the Caribbean islands and its protected bays. The British even gave the island a Latin motto  statio haud malefidia carinis which translates as safe haven for ships. With superyacht-friendly deep waters close to shore  the waters around the Pitons are said to be as deep as the Pitons are high  plus several marinas and harbours around the island, its small wonder that St Lucia is popular with the yacht and charter industries. The fact that its also stunningly beautiful, varied, vibrant and friendly is icing on an already good cake. 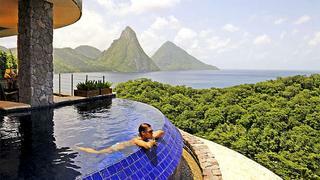 Here then is a selection of some of the finest hotels St Lucia has to offer. The three hotels visited are world-class five-star resorts, each offering something different, and each guaranteed to enhance your charter experience. Firstly Jade Mountains cliff-edge location offers privacy with jaw-dropping views over The Pitons, secondly Anse Chastanets beach-side retreat is the ultimate Caribbean experience and thirdly, the colonial style and elegance of Cap Maison embodies the spirit of St Lucias past. Ambience: Ecologically sound, natural materials, jaw-dropping views and more fresh air than you might expect. Should you ever need the yachting experience on land  perhaps to extend that feeling of serenity and open space before or after your charter  then architect Nick Troubetzkoys Jade Mountain is undoubtedly the closest youll find anywhere in the world. Its a remarkable, hill-clinging structure overlooking The Pitons that makes the most of its stunning views thanks to clever use of locally-sourced, natural materials, the infinity pool in each sanctuary  because room wouldnt do them justice  and the complete absence of an outside wall. No. Really. Troubetzkoy wanted to make guests feel that they are floating into space and becoming one with the view  and hes succeeded. There is a hint of James Bond villains lair to Jade Mountain but then again its a rare super villain whod have a beautiful spa, not to mention exquisite service, an award winning chef and their own 30 acre organic estate providing all the fruit, vegetables and herbs. They even have their own cocoa plantation and produce all the chocolate used on site. Sometimes stunning doesnt quite cover it. This would be one of those times. Ambience: The breeze through the palms, the lapping of crystal waters on golden sands. Sigh. A more traditional, laid back Caribbean experience. Close to the port at Soufriere  and just down the hill from Jade Mountain  lies Anse Chastanet, Nick Troubetzkoys first venture on St Lucia. There are many parallels between the resorts  exceptional service, great creature comforts, an awareness of the environment, the same organic estate providing incredible produce  but Anse Chastanet is less about extreme luxury, more about relaxing and the traditional Caribbean experience. However, in Apsara, their Indian-influenced restaurant, they arguably have the best food on the estate. Theres also a vegetarian restaurant, and on the neighbouring beach Anse Mamin  which is most readily accessed by boat  the Jungle Grill, which lays justifiable claim to having the best burger on St Lucia. Sailors actually get the best view of Troubetzkoys resorts as his vision and sensitivity make the most sense observed from the water. At (spectacular) sunset, with the sounds of live jazz or a steel band drifting your way and dolphins playing around the bow, a look back across to the resort shows that most is hidden by trees, and anything visible  the green roofs, the stone structures  is sympathetic to its surroundings. 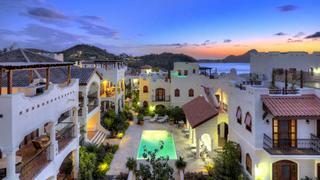 Ambience: Peaceful, almost Colonial in style and embodying all that is good in St Lucias history. 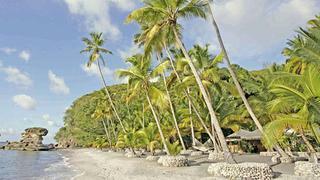 And the overall experience is pure St Lucian. General Manager Ross Stevenson is a charming Scotsman, and the apparently effortless calm at this beautiful and well-appointed hotel, and the friendly, five star service is clearly the result of much excellent training. Happily, thats not been at the expense of individual personality. The restaurant, The Cliff at Cap, is seen as its own entity rather than a hotel dining facility. Of course when your chef, Craig Jones, is a white, Welsh, Rastafarian powerlifter with several years of Michelin-starred kitchens under his belt, a sense of individuality was always likely.